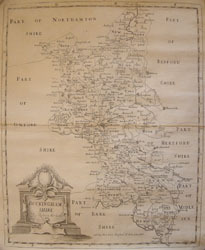 Copper Engraved map, uncoloured as issued, First Edition, Ornamental title cartouche. - from its source to the sea exhibiting the picturesque scenery and principal objects on its banks with the distances from London bridge Etc. also a panoramic map of the River Medway. Engraved on steel and beautifully coloured on a sheet four feet in length. Jas Reynolds & sons n/d. original title to slip case on verso. 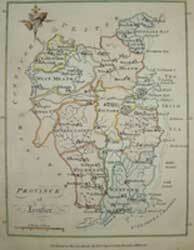 First published by James Reynolds in 1834, this new edition ca 1840 is a fine large strip map rendering a Birds Eye view of the 215 mile long river Thames from its source at Thames Head, nr. Kemble, Gloucestershire, to its mouth at the Thames Estuary and Nore Light, as the course of its ancient river name Isis runs through the beautiful Thames Valley towns of Ashton Keynes, Lechlade, Oxford, Abingdon, Wallingford, Reading, Henley-on-Thames, Marlow, Maidenhead, Windsor & Eton, Staines and Weybridge, before entering the Greater London area., where much of today's west, south and east London were then still separate villages. Major Roads and Railways are shown as is the Thames tunnel, then still under construction (begun 1824) For those who enjoyed the Jubilee pageant and other activities along the length of the river flowing with liquid history, this is a great and scarce item. 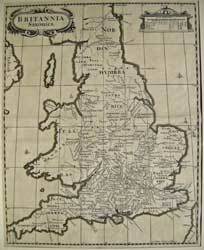 HIBERNIAE/ BRITANICAE INSU/LAE NOVA DES:CRIPTIO./ERYN/irlande. 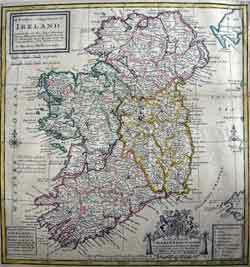 A series of maps from the Hibernian Atlas. 7 1/4 x 5 3/4" (8.4 x 4.6 cm) approx. Original outline colour. Some strengthening along folds and edges, potion of top left margin cut close for fold, printed #12 in top right corner.